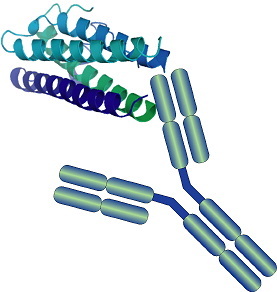 Anti-Drug Antibodies (ADA) may induce unwanted side effects, especially in biotechnology-derived pharmaceuticals, such as therapeutic antibodies and growth factors. Hence, ADA have been subjected to increasing scrutiny by the regulatory authorities using immunogenicity safety studies [1-6]. ADA have been observed in preclinical and clinical studies resulting in significant changes in toxicology, pharmacokinetics, and efficacy. These effects result from the generation of drug-induced (neutralizing) autoantibodies against e.g. EPO [10, 11], FVIII  or insulin  and can be responsible for allergic reactions, or even anaphylactic shock. As a consequence, studies on ADA have become inevitable [7-9] for bioengineered pharmaceuticals including biosimilars. Adverse immunological reactions may vary widely, depending on how the active ingredients are structured, produced and applied. For example, the expression of anti-Fc antibodies, anti-idiotypic antibodies or antibodies against glycosylated antigens may appear. The detection and characterization assays for ADA must therefore be developed, customized and optimized for each drug. If the pharmacokinetics (PK) of the active ingredients are also available, possible changes in the PK may be correlated with the effects induced by ADA. vivo Science offers the complete development, implementation, and optimization of ADA assays. We can also adapt and validate your in-house assays in compliance to GLP guidelines. Taking immunogenicity assessment of therapeutic proteins to the next level. 8: J. Neurol. 2004 Jun;251 Suppl 2:II4-9. Immunogenicity of recombinant human proteins: causes and consequences. 9: Regul Toxicol Pharmacol. 2009 Jul;54(2):164-82. Ponce R, Abad L, Amaravadi L, Gelzleichter T, Gore E, Green J, Gupta S, Herzyk D, Hurst C, Ivens IA, Kawabata T, Maier C, Mounho B, Rup B, Shankar G, Smith H, Thomas P, Wierda D.
Epoetin-associated pure red cell aplasia: past, present, and future considerations. McKoy JM, Stonecash RE, Cournoyer D, Rossert J, Nissenson AR, Raisch DW, Casadevall N, Bennett CL. Antibodies to the FVIII light chain that neutralize FVIII procoagulant activity are present in plasma of nonresponder patients with severe hemophilia A and in normal polyclonal human IgG. Moreau A, Lacroix-Desmazes S, Stieltjes N, Saenko E, Kaveri SV, D’Oiron R, Sultan Y, Scandella D, Kazatchkine MD. Immunogenicity of recombinant DNA human insulin. Recommendations on risk-based strategies for detection and characterization of antibodies against biotechnology products.